Some time ago, after testing many strollers, I was wondering if I’ll ever put my hands on something that would suprise me again. 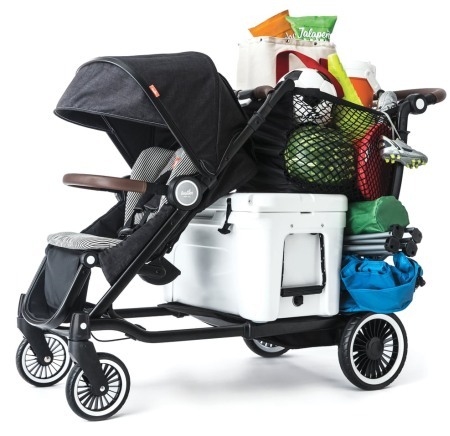 Let’s say it would have to be a stroller that could carry over 100 pounds and fold easily, wouldn’t take too much space at the same time and (I won’t restrain myself) look just great. Impossible goals, I assumed. I was wrong. 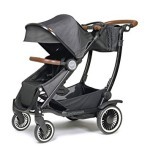 The answer for the above is the Austlen Entourage, aiming to revolutionize the features of a stroller, making it a true transformer, capable of handling 2 kids and a refridgerator, you just bought while strolling. It has some pros and cons, as anything, but I must admit, this one makes my jaw drop. I won’t blame myself, I asked for it. 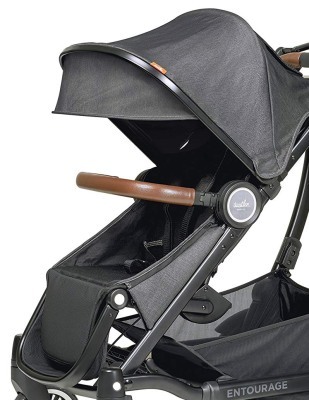 You can use this stroller for a long time as your baby grows. It may be used in the single mode, where it’s a travel system complete with a baby car seat, or in the double mode, with 2 baby car seats, or a baby car seat plus a main seat, or with 2 seats, or with a main seat plus a sit-n-stand, or even in the single mode where a rider platform is in the back. You can use it with twins or with a newborn and a toddler. 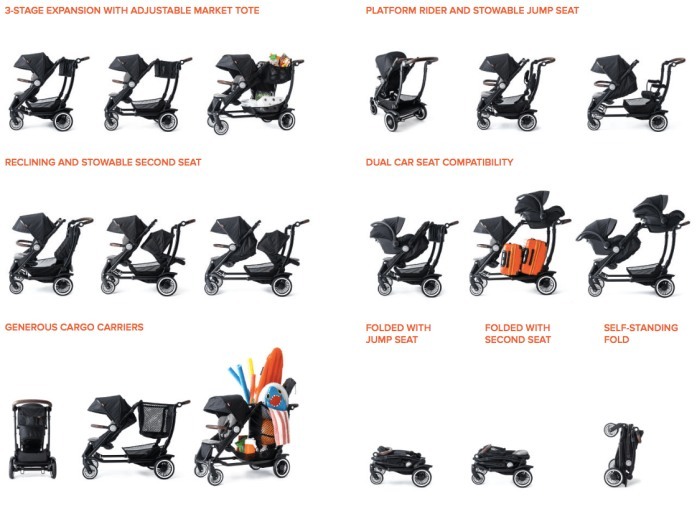 Another neat thing about this stroller is how it comes with more than thirty different configurations available. 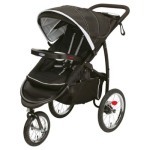 Convertible stroller / Shopping stroller 150 lbs The best stroller for shoping! The basket here is among the largest on the market right now. 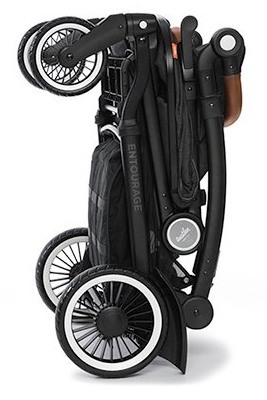 Entourage can be converted into an actual double stroller when you add a jump seat in the back of it. I expected that, considering how many different features this product has, there would be a bulky, complicated fold, and yet it turned out that it was actually pretty compact and easy. 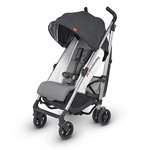 Sure, the fold may not be quite as compact as typical lightweight strollers, but this model should rather be compared to other convertible strollers, like Britax B-Ready, City Select or Uppababy Vista. Its ability to fold down with both of its seats still attached means the whole process is quick and easy. 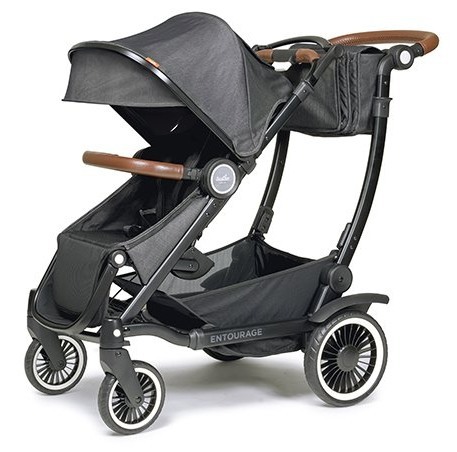 The weight of this stroller is thirty pounds when in the single mode (as per the official information), whereas in the double mode it is probably somewhere around thirty-seven pounds (although there is no information available on the 2nd seat’s weight). The seat is pretty spacious. Its width is 12.5 inches, with seat back of 18 inches and measuring 26 inches from the seat’s back to the canopy’s top. And although I did like the height of the canopy, the seat back could have been a bit taller, around 20 inches. It has a recline operated with a one hand lever. It is pretty deep, which allows it to accommodate babies from birth all the way up to fifty pounds. It is perfect when changing diapers or for longer naps. The seat isn’t reversible by the way. On top of that, the seat also has a nice mesh in its back to make air circulation better. There’s a padded, adjustable five-point-harness with a central release buckle that has to be unlocked with both hands. The harness does it job nicely and it’s impossible for your kid to get out of it and run around at the mall. 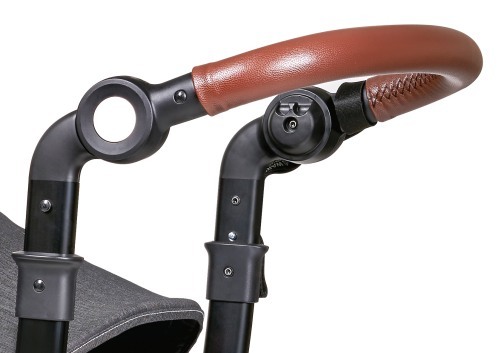 The handle bar can be set from 36 to 43 inches above the ground level. The cover is made of soft leather similar to those on steering wheels of cars. So luxurious! The huge 2 panel canopy equipped with a pop out sun visor may not really go all the way to the buggy’s bumper bar but it can provide a decent sun protection nevertheless. The sun visor or the panels could have been just a tiny bit bigger as it would provide protection during sunrise and sunset as well this way. You also get a mid-size peek-a-boo style window made of dark mesh and closed with magnets. This product’s frame was designed pretty cleverly and uniquely. There are 3 different linear stages to choose from at any time. 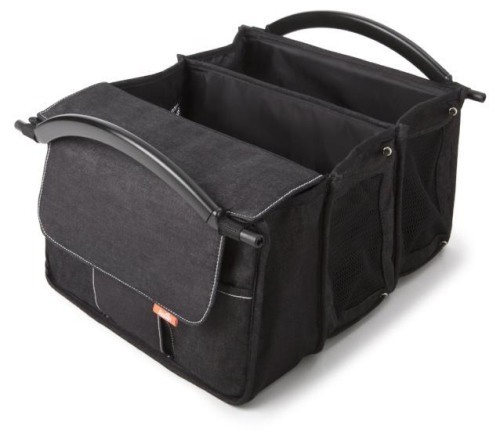 With the frame extended, you’ll be able to bring along particularly big items thanks to the basket and the lower frame while also being able to fit quite a few tinier items thanks to the market tote that can extend. The product’s durable frame, which was made of anodized aluminum, has a total capacity (with kids included) of up to one hundred and fifty pounds! There are no other strollers available with a weight limit this high. It can handle both children and several suitcases as well. Unbelievable! It is included! This market tote makes a pretty interesting accessory, one I’ve never seen on any stroller before. 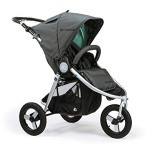 It can actually expand with the stroller and its capacity is up to thirty-five pounds. You can go shopping with it! Although this tote may look like a filing folder or something, it can actually fit quite a lot of things inside. 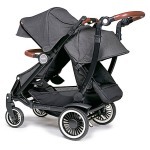 Entourage can be converted into an actual double stroller when you add a jump seat in the back of it. There’s only 1 configuration available though, with the kid in the jump seat faced towards you and the one in the main seat faced to the front. The 2nd seat has a bit smaller size but its canopy is still big enough and the recline comes with three positions. Don’t let me be the only one to give my thoughts about Austlen Entourage. Check what other parents, who use it in everyday life say about it by clicking here! The recline here is pretty deep but it doesn’t come with a flat position like the main seat does. You can fit a kid from six months all the way up to thirty-five pounds in it. What I really love about the seconnd seat here is how it can be folded down when you don’t need it without being removed from the stroller, which makes the frame shorter. And if both of your children wish to have a nap, the stroller can be extended so you can recline both of the seats all the way. Love it! It is also possible to have 2 baby car seats on this stroller. You may make it just like a standard travel system, with a baby car seat going on top of the main seat here, or maybe you could add a car seat in place of the tote, placing your newborn much closer to you. If you ask me, I’ve NEVER seen a baby car seat positioned closer on a stroller before. Back when my little one was a newborn, I could never get enough of her. I just wanted to always see what she was up to and be able to see each of her smiles. 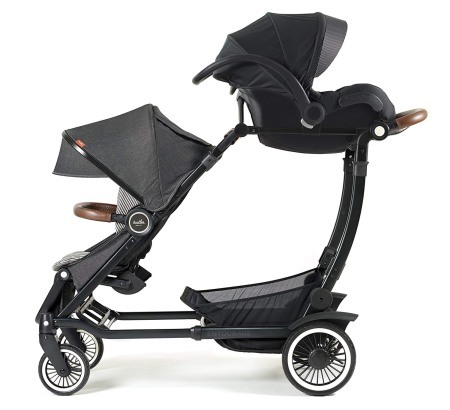 There is also a “Sit-N-Stand” kit available that turns the Austlen Entourage model into an actual double stroller. You can easily fold the seat when you don’t need it. It is possible for your kid to simply use the rider platform as well. What I also loved in this particular model was a hidden so called boot that can be used to make a bassinet style environment for the baby. The boot is kept hidden in a pocket below the leg rest. By the way, I still haven’t heard a thing regarding bassinet options for this particular model here. It rests on 4 EVA foam-filled wheels that never go flat, with swiveling front wheels you can lock straight when going over rougher terrains. The back wheels are 10.5 inches wide whereas the front ones are 7.5 inches wide. 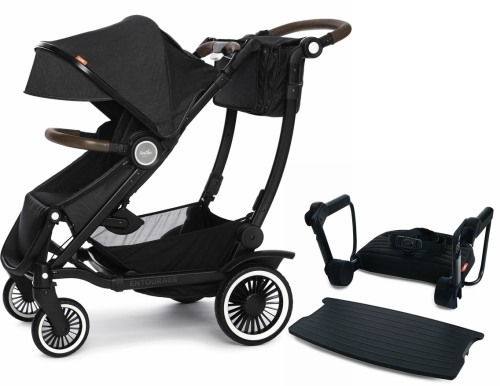 Despite being able to handle pretty rough terrains, this stroller isn’t an all-terrain stroller. The wheels do have a decent size for every day uses though, like running errands, going to the park or taking long strolls around the neighborhood. The wheels have ball bearings inside and there’s an all wheel suspension, too. It makes this product very maneuverable and easy to navigate. You can find the brakes between the back wheels, they are convenient to use even when wearing flip-flops. The storage features in Entourage are outstanding. The basket here is among the largest on the market right now. It is also pretty easy to access plus its capacity is up to sixty-five pounds. Quite an impressive result! 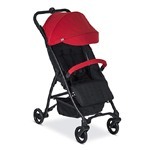 If this stroller seems to be the right choice for you, you should check if there are any discounts available. There are many different configurations available in this model thanks to all the seat/car seat combos as well as the three stage expansion. You should remember that the front seat here isn’t reversible, though. On top of that, the second seat can only be set to face the parent. Either way, the majority of those configurations were counted here thanks to the expansion of the frame. Considering how many different features this product has, I expected the fold here to be quite complicated and bulky. Nothing of the sort! 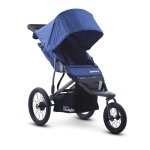 The fold here is actually incredibly easy and compact considering how big this stroller is. It can also be folded while the second seat is still attached! Piece of cake! It also comes with an automatic lock, as well as a standing fold too. It is also possible to drag it behind you like a luggage. 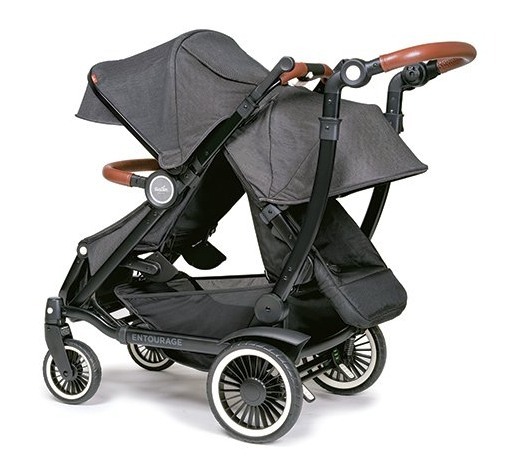 Austlen Entourage is a great, large and roomy stroller, with which you can easily go shopping regularly without fear that you will not have enough space. 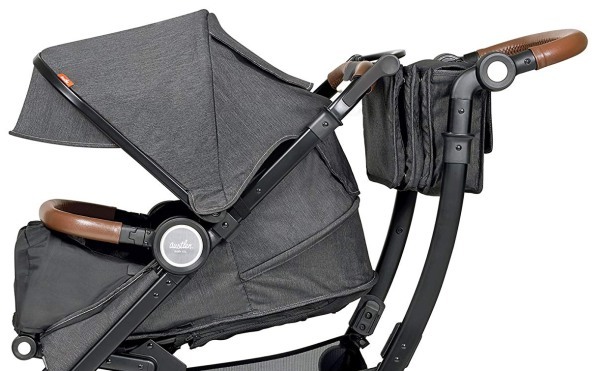 However, if you do not need so much space and you want the stroller to be easily convertible to a double stroller, you should also consider buying the Bugaboo Donkey. 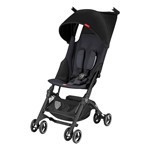 It’s a great model that you can transform easily from mono, duo or a twin stroller. 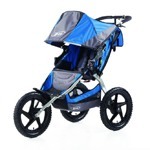 Check my comparison of both strollers below. Convertibility Austlen Entourage can be converted into an actual double stroller when you add a jump seat in the back of it. 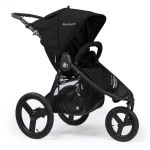 Bugaboo Donkey convertible stroller transforms easily from a mono, duo or a twin stroller.